Waggy’s Tales (Breedon Books, £12.99) by Dave Wagstaffe. Some players can score 150 goals in a career and struggle a couple of decades later to recall more than half a dozen of them. Fortunately for readers of Waggy’s Tales, Dave Wagstaffe (who stresses that he netted considerably fewer than that sort of figure!) has excellent power of recall, even for small detail. When we interviewed him for the Official History of Wolves dvd in 2006, he confessed beforehand to feeling as nervous as a kitten. Not that his unease stopped him being the star of the show. And his personality oozes out now from this highly personalised publication. Wagstaffe is without doubt the best winger Wolves have had since their 1950s glory years and, as such, has a compelling story to tell. Only 14 men have played more games for the club and the fact that he not only represented Wolves in a major European final but also scored in one goes some way to explaining why he’s regarded as one of the best no 11s never to have been capped by his country at senior level. He played in the sides who were relegated and then promoted in the mid-1960s, in the squad who won the 1967 North American Soccer League, in the team who won the Texaco Cup, in losing sides in the FA Cup and League Cup semi-finals and in the 1974 League Cup final against his former club Manchester City – the latter providing a fascinating chain of events in itself. Throw in his dry wit, the fact he travelled the world with Wolves and something approaching the loathing he had for Bill McGarry, his manager at Molineux for almost eight years, and the tapestry becomes even richer. 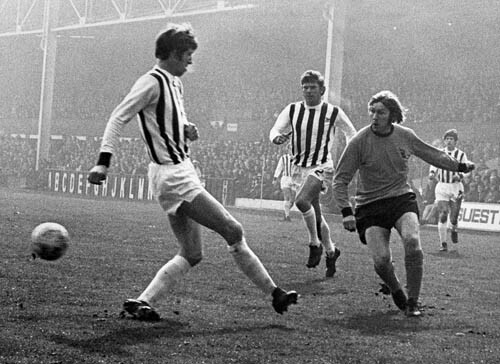 Waggy outfoxes Albion’s John Wile and John Kaye in Wolves’ 4-2 win at The Hawthorns in March, 1971. It isn’t just the lengthy sections about his Molineux playing career that hold the attention. 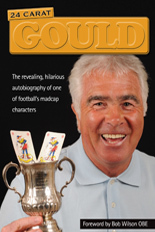 The pages detailing his time at Blackburn Rovers and Blackpool are highly entertaining, too, as are the chapters near the end about his time in charge of the Wolves Social Club and Waggy’s Bar. If you think footballers get into some scrapes in their youth, wait until you read this bit! 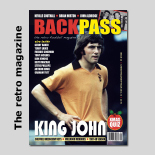 Wagstaffe points out that his service at Molineux stretched well beyond the 12 years of his playing time there; in fact the front cover reminds us that he was on the pay-roll in four different decades.It all adds up to a terrific piece of work – one of which it is hard to speak too highly. 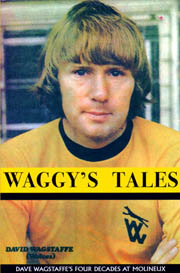 Waggy’s Tales is available from Wolves’ usual retail outlets, from publishers Breedon Books or from Thomas Publications. Posted on: Friday, August 1st, 2008.